The American Heritage Dictionary of the English Language describes cassava as a tropical American plant with a starchy root from which tapioca is derived. To us Latinos from the Caribbean, it’s yuka (yoo-ka). Yuka is most commonly served peeled and boiled with a bit of olive oil sprinkled on top. But it also yields a bitter or sweet starch known as manioc which is used in the making of farina and, of course, tapioca. For those interested in arcane terminology, manioc is a word of Tupian origin, attributed to the Tupis, a group of American Indian tribes living along the coast of Brazil and the Amazon River valley. To explorers from the Old World, this new food was a wonder. Finely grate the yuca with a shredder or food processor. Rinse in a colander with cold water. Drain, pressing with the hand to remove as much excess moisture as possible. Place in a bowl, add turmeric/olive oil mix, and salt. Mix well, and set aside. Heat oil in a large skillet or fry pan. Add beef and stir fry over medium heat until meat loses its color. Add coriander, cumin, garlic. cilantro, onion, and tomato sauce. Sauté 3-4 minutes. Simmer on low heat, uncovered for 15 minutes. Add 3 tablespoons lukewarm water and cook, covered, another 15 minutes. Place ¼ cup yuca mix on a plate or large sheet of wax paper. Spread the mix to form a circle. 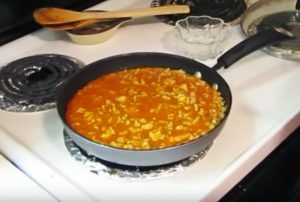 Place a tablespoon of beef filling in the center. Bring edges together to close filling and shape into a cylinder or croquette. Repeat until filling and yuca are filled up. Deep-fry in hot oil until golden brown (about 4 minutes each). Remove and drain on paper towels. Yield: about 8 to 10 alcapurrias, depending on size. Alcapurrias De Yuca , Stuffed Cassava. One of the Great Delights of Puerto Rican Cuisine. Not to be missed !